Here we are at the end of week 7 Term 2. How the term flies past. Thank you so much to all the parents who came to the parent night in week 5. 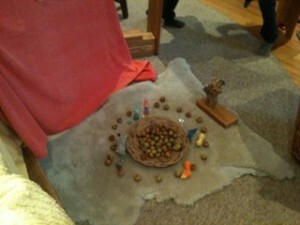 It is lovely to get together as a community and share aspects of the curriculum and each others company. Also a big thanks to the Parents and Friends for providing such lovely snacks for us to enjoy on the evening. I trust that you have all received the summary notes of the evening. I appreciate that it is not always easy to get away in the evening with little people, so hopefully these notes will help those people who were not there have an understanding of what was discussed. I have placed some more articles in the Parents Articles folder near the gate, please help yourself and let me know if you would like more copies. If parents have particular areas of interest that they would like some information about regarding Kindergarten, I am happy to try and follow up these areas and find some relevant articles. Please let me know. Thank you to parents who have already given me some suggestions. Parent/Teacher Interviews are coming up on the 3rd and the 17th of June. These are both Fridays. I encourage you to team up with other parents to share the child minding responsibilities while you are having your interview. Last year some parents booked two appointments back to back and then swapped child minding duties for each other, this seemed to work quite well. I have scheduled 30 minutes for each interview. This is a relatively short time,but an advance on the standard 20 minutes. if you do have particular questions regarding your child I encourage you to contact me prior, and let me know in advance. This way I can prepare and it will ideally be a satisfying time for us both. Our festival is coming up soon, invitations will be going home shortly. We farewelled our dear friend Issa last week. His family have sold their house and are moving back to Melbourne. We knew this was going to happen at some stage, but it is always sad when it finally does happen. We enjoyed a lovely shared lunch with Issa and his family this week to celebrate his friendship and contribution to our Kindergarten family. The children had made a lovely book of pictures for him to take home. Mackinley had a very proud moment when he presented Issa with this book from the Kindergarten children. Well done Mackinley and Farewell Issa. Good luck with your new adventures. Here are some pictures of ‘King Issa’ on the his last day. 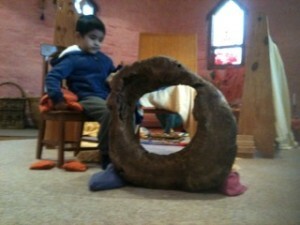 He created a beautiful viewing scene that the children needed to bob down, and peer though the round log, to see. It was was a very beautiful game and a lovely play moment to share with Issa in his last days with us all. Warm, woolly socks for icy cold feet. Now King Winter you may call. 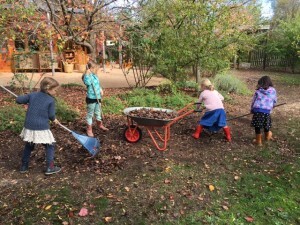 The children have been busy in the garden, tidying up the last leaves of autumn and mulching the vegetable garden. 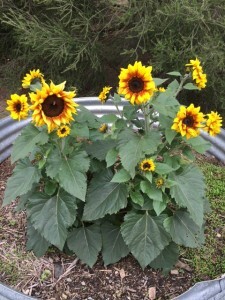 Our sunflowers are bravely flowering, reminding us of warmer days. Our Winter Festival will be on Wednesday 15th June at 5.45pm. You will receive an invitation with all the details next week. Mid-year reports will be posted this week. I would like to meet with all parents to discuss how your child is going. Please make a time to see me on Friday 10th or Friday 17th June. Thank you to all parents who participated in our class meeting on a very cold night! These times as a class group of Parents are so essential to the support needed for our children to grow as a class community with the adults surrounding them. Class 1 are enjoying a new family of guinea pigs kindly donated to us by a member of the wider community of Castlemaine. We thank her very much and assure her they will not be short of cuddles and care. Angel A with her beautiful heavenly sound , her strong, earthly sound and the sound of her name has visited us this week as we listen intently – the beginning of our experience of the vowels. Our excursion to the Botanical Gardens last week was wonderful – thank you parents who joined us – we collected more than 1000 ( we counted by tens!) acorns. Thank you to the parents who attended our class meeting last Wednesday evening. After viewing the children’s work and sharing observations and explanations of our main lessons for this term, we worked in the social realm. We acknowledged our children’s strengths and discussed the challenges of friendships and playground rules. I will put together and make available a summary and reference list to explore how we can further support our children socially. A quote from Steve Biddulph helps us keep perspective in these matters – “The fact is, human relationships are so complex that it takes decades to learn how to get them right. You and I are still learning.” Thankfully there are skills of friendship that we can all benefit from practising. Much appreciation to the parents who worked so generously at our recent Working Bee. Our class two garden areas look well tended and refreshed after all your efforts. This week we have begun our second story for our “Mighty Leaders” Main Lesson. We are listening to the story of Moses and how he is called by YHVH to ask the Pharaoh to release the Hebrew people from their slavery and let them leave Egypt. Moses becomes a great leader but not without many set backs. The children are continuing to develop their cursive writing in this Main Lesson and are enjoying taking the time to draw the various pictures from the story. We have also begun to play some recorder songs in rounds which the children are loving and have taken to very easily. Don’t forget that next Tuesday the 31st of May at 7.00pm is our “Discussion of the 9 year old child” session if you would like to attend. From the Norse Myths we are venturing forth seawards, learning about knots ~ making them and drawing them. Our next Main Lesson is a Maths one, sailing the high seas and making Ship Log books to keep track of our nautical miles sailed, how many supplies we have left, wages that need to be paid and rations for each crew member by using the four processes. Well done Class Four on a wonderful first Soiree last week! Greetings to all friends and Families of Class 5. I know that many of you were able to attend our recent Soiree and then our Class Play, “Zarathustra”, so you will be well aware of the main activities in the class over the past weeks. The children also played in an Ensemble for the recent School Open Day, and have are showing themselves to be growing into wonderful little people. They have worked hard both as individuals and as a group and I am so proud of them, and I know that Danilo is also. The dynamics of the group are lively and full of fun. Noisy often also ! I wish we could have gone for our planned outing this week to give the class a treat for all their work but the weather was not disposed to be kind. However, hopefully the outing can go ahead next week ! We have also been spending time continuing to work on decimals, quick tables and maths facts, and improving our spelling. Also we are really enjoying the weekly library browsing session and special reading with Kate and Julie. Thank you for all the support that you put in at home to help create this wonderful class. Thank you also for the afternoon teas and suppers provided with the leadership of Julie. A small Class stood in a large hall full of people on a Friday night. At last Class 8 students had reached the time to present their Projects, both Major and Minor. Mentors, parents, grandparents, brothers, sisters, friends and teachers could sit back (or forward) and take in the story of each student’s quest; their initial intention, the process they followed, the relationships they formed, the problems encountered and solved, dramatic tensions felt and the humorous moments and the insights gained. Some years back the College of Teachers decided to create the opportunity for Class 8 students to explore their world by creating their own quest and so become actively and intimately involved with their immediate communities and the learning process. At the same time, students were to be given every opportunity to reflect on their discoveries and the processes involved during and after the Project. The Project involves two educational processes that help integrate the academic, artistic and active dimensions present in project based, personalised learning. As our students gave their oral presentations last Friday we came to appreciate the extent of their experiential learning and perceive the transformational effect the experience had on them and others around them. The experiential learning can be understood as the process of actively engaging students in an experience that will have real consequences. Some of these were identified in their speeches and in the displays on show around the hall and in the audio-visual component. Students are encouraged through the experience to make discoveries and experiment with knowledge themselves instead of hearing or reading about the experiences of others. Evidence of transformational learning could be understood when students spoke of insights and realisations that have become part of their ability to change, solve problems, find resolutions and develop perspectives in a more conscious way. The Class 8 Project acknowledges that because people learn in different but interwoven ways, one responsibility of the School and its teachers is to create a supportive community of learners; individuals, young and old, who are united in a shared experience of trying to make meaning of their life experience. The Class 8 Project gives the form for adults and students or learners alike to share the responsibility for constructing and creating the conditions under which transformative learning can occur. new attitudes and capacities they have developed as a result of their quest. Congratulations to each student. You were fine examples to the school of community of learners on a personal quest. Thank you for sharing your work and gifts. A sincere thank you to all who have assisted them, shown an interest in them and reached out to them through the course of the Projects. Thank you also to parents and Class Carers, especially Delwyn and Jane, for providing the supper and finally, thank you to Lucas Bester from La Trobe University School of Education for volunteering his time and expertise as assessor. Class One will be adding one more song to their repertoire for this term – the classic nursery rhyme Brille, brille petite etoile (Twinkle, Twinkle little Star). In Class Six we are completing our historical look at France under Roman rule and will be using our recent work on ‘mixed up sentences’ to go one step further, by translating some French alphabetical tongue twisters and maybe even writing a few of our own! And in Classes Seven and Eight we have extended our vocabulary work on les animaux by starting to learn the song Le Fermier dans son Pre (the Farmer in the Dell). For Class Seven this has been supplemented with some new board games to consolidate their vocabulary; and for Class Eight their work on the story of a typical French family, la famille Picon, continues. It was an unexpectedly exciting and enthusiastic fortnight for the children and myself lately. I had advised Classes Seven and Eight that they would be undertaking the Beep Test to help gauge their current fitness levels and revisit the test later in the year to hopefully see some improvements taking place. To my surprise the children were very enthusiastic about the test. Class Six then also wanted to get involved after picking up on the excitement of their older peers so they also completed it together with a few older students joining in again. For some it was a very new and daunting experience, but I am certain many new discoveries took place and a greater sense of self was gained. Well done to all students who participated, some with minor injuries, and special congratulations to Alex, Rilke and Lachy who achieved the best scores in their class. Let’s all strive to beat our scores next time round! Class 5 will be building upon their established soccer skills throughout the remaining weeks of Term 3. Soccer is very much a favourite sport of the majority of our students! Next term we will look towards utilising the Multipurpose Room and gym mats in the colder, wetter months for some gymnastics and circus skills. I know a few Class 5 girls will be thrilled when we start this unit! Reminder to parents and students that P.E. is on Mondays this term for Classes Seven and Eight, and Fridays for Classes Five and Six. Please ensure your child/ren have suitable clothing and footwear, and perhaps a water bottle. The footwear of a few students lately has impeded on their ability to participate accordingly…. Finally, I am not officially undergoing the Parent/Teacher Interviews this year due to my short time in the new P.E. role, however I will still place a sheet outside the office for parents. Should you wish to meet with me please leave your name on the sheet and I will contact you to arrange a suitable time. My name is Raziel and I am the new Spanish Teacher. I am writing to you to introduce myself and share a little bit of my background with you. I was born in Mexico where I studied music and became a classical guitarist. After finishing my music studies I met my now wife who is Australian and with her I came to live and work in Australia where I have stayed during the last six years. My interest in Steiner Education had lead me to become a teacher, first music teacher, then I continued to study the Steiner teacher training to become a classroom teacher and now I have this amazing opportunity for further growth and development as a Spanish teacher. It is for me an honor to have the opportunity to be part of the Castlemaine Steiner School and I am looking forward to working with your children and sharing with them some of my native culture and language. We would like to welcome our new Spanish teacher to our school! Raziel was born in Mexico, has completed Steiner Teacher training and has recently returned from a stint as a teacher at Tjuntjuntjara Remote Community School in W.A. Also we hear he is a very accomplished musician…oh, and he speaks Spanish too! Raziel will be teaching from Wednesday to Friday, starting next week on Wednesday 1st June. The sheets with available days/times for Parent/Teacher Interviews will be available for completion outside the office tomorrow, Friday 27th May. Could parents attending school assemblies with young babies please take their children outside if they are becoming loud and restless. Thank you. Goat Masterclass - Bullarto P.S.